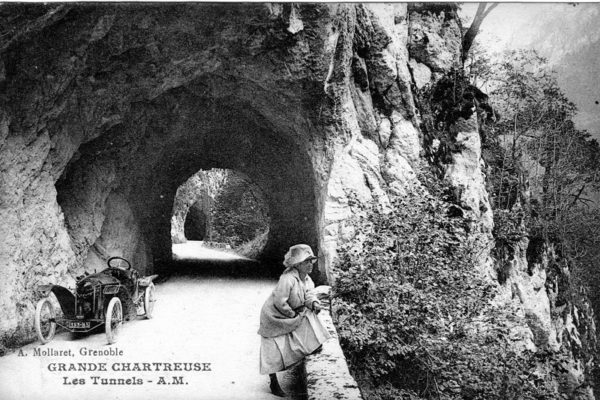 This is a professionally printed postcard showing the tunnels at Grande Chartreuse, this being a monastery of the Carthusian order north of the city of Grenoble in the commune of Saint-Pierre-de-Chartreuse, France. The postcard has a cancellation date of 7 July 1921, but the writer suspects that the image probably dates pre-Great War. Of interest to the reader will be that, as today, the road is only fit for cyclists, so it is quite fitting that the vehicle illustrated is a Bédélia, an archetype of the French Cyclecar Industry. These vehicles were manufactured by Bourbeau et Devaux and latterly by Mahieux et Cie between 1910 and 1925 to a design by Robert Bourbeau. Rather than scaling down existing motor-car layouts, Bourbeau, like other cyclecar manufacturers, adopted motorcycle engineering practice for his design. These early vehicles carried two people in tandem with the passenger taking the forward seat, nearest the accident, and the rear driver operating the cable and bobbin controlled steering. 5½hp and 3½hp single-cylinder engines and a V-Twin 10hp engine were used, and rear wheel drive was via a belt which could be moved between pulleys to aid a two-speed transmission. The method of changing gear was unusual. The rear driver had to operate a lever which slackened the belt by moving the rear axle forwards and then the passenger had to move the belt between pulleys by means of a separate lever. How the car was driven without a passenger is not explained. On later vehicles, the levers were moved so that the driver could steer and change gear by himself. The front axle was centre pivoted with a single mid-mounted coil spring as the front suspension, and elliptic leaf springs at the rear. Before World War I, Bédélia cyclecars sold very well, even in the UK. In part, the enthusiasm for these light-weight vehicles was assisted by the pre-Great War petrol crises, not helped by France not having oil reserves of her own. Manufacturing rights were obtained by a dealer, a Monsieur Binet in 1920 and he had an updated version of the cars made for him by Mahieux et Cie. The body design was modified to let the driver and passengers sit side-by-side and a conventional three-speed gearbox and single- and two-cylinder engines of up to 990 cc were offered. The cyclecar eventually gave way to the Lightcar and the miniature big car like the Morris Oxford, and by 1925 the fascinating Bédélia ceased to endure.